At Chocology, we are interested in all aspects of chocolate, including reasons why we want to and should eat it. Spawned by an article in the Huffington Post, “17 Reasons You Should Eat Chocolate Every Day” we went on a search to prove why we really should eat chocolate every day. Who doesn’t love chocolate? It’s rich, luscious taste and consistency has enamored young and old alike for centuries. We all feel a little guilty when we eat it, don’t we? But what if indulging in chocolate is not as bad as we originally thought? In fact, what if it actually saves lives? In recent years, the study of the effects of cacao on the human body has increased at Universities around the world. A publication from The Center for Flavonoid Research suggests that eating cacao daily provides many health benefits including the healing of certain chronic ailments. Another article published by Dr. Bret S. Stetka at Medscape.com also suggests benefits of eating chocolate and even offers amounts that should be consumed daily to attain these benefits. So what are the benefits? Here are just five benefits of eating quality chocolate on a daily basis. In his article on Medscape, Dr. Stetka references a study that suggests that 3.5 ounces of dark chocolate per day for a month can lower blood pressure by 2.27/2.20 mm HG. That’s quiet impressive! The blood-pressure-lowering properties are attributed to the flavanols found in cacao. Now there’s a great reason to eat chocolate every day! Professor David Kennedy of Northumbria University in England conducted a study exploring the benefits of chocolate on the human brain. His group suggests that high levels of flavonoids found in quality dark chocolate can improve brain function when performing mentally challenging tasks, such as counting backwards from 999. They also found that subjects were less tired after performing these tasks. As stated by Stetka, Neurology published a study reporting that individuals who eat at least 1.8 oz of chocolate per week have a 17% lower risk for stroke compared with people who ate less. No, we’re not kidding. Frequent chocolate consumption is associated with a lower body mass index (BMI). The antioxidants found in cacao are believed to contribute to metabolic health, which in turn can help you stay trim. Universities around the world have recognized and proved some of the benefits of eating chocolate and studies are still being conducted. 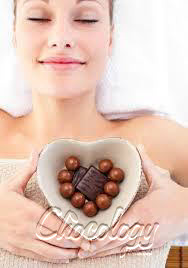 Knowing your chocolate can yield great benefits not only to your palate but also to your health. Go ahead and have a bit every day! You may be very glad you did. This entry was posted in Uncategorized and tagged chocolate, health. Bookmark the permalink.